Other than the malls of the strip and the nearby Boulevard Mall, the vast suburban expanse of Las Vegas, Nevada–much of which has been built in the last decade or two–is covered by only two full-line enclosed shopping malls, on the southeast and northwest sides of the city. 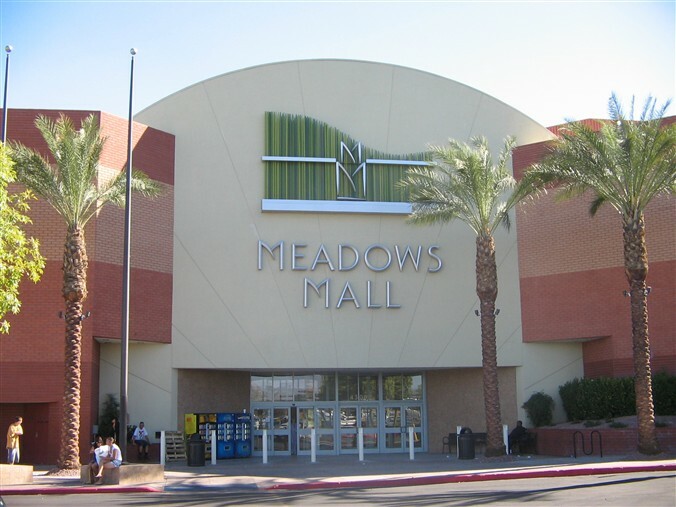 The Meadows Mall, which is a 900,000 square foot, two level enclosed mall located in the city of Las Vegas itself but which serves the large and sprawling suburb of Summerlin (the largest planned community in America) as well, is the one on the city’s northwest side. Perhaps because so much of Las Vegas’ first tier shopping is clustered in the center of the city, and because so much of the city is so new that it contains many big box plazas, lifestyle centers, and other newer styles of development, the malls don’t feel as important as they do in many older and more established cities. 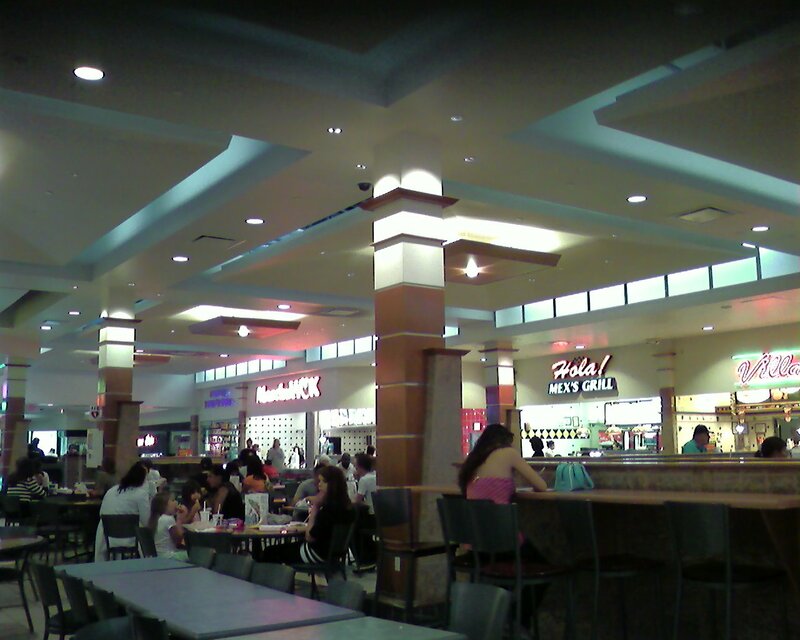 Meadows Mall is certainly functional, with anchor stores like Macy’s (a former Broadway store), Sears, Dillard’s, and JCPenney, but for the most part it is a functional and unremarkable suburban mall, neither high nor low end but comfortably treading middle ground. 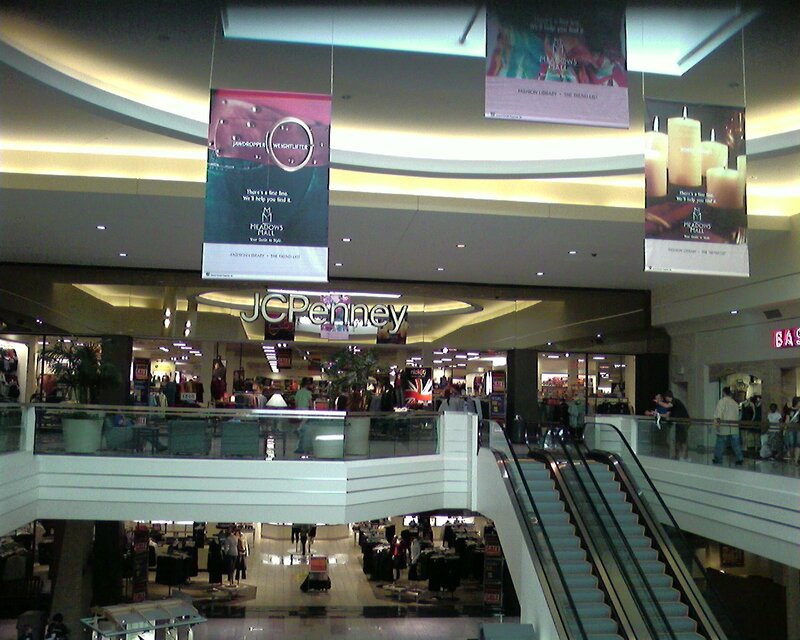 The decor inside and out is pretty standard, though I give high marks to the mall’s sign, with its faux-grass scheme. Apparently, many local residents think even less of it, often referring to it as the “Ghetto Meadow” or “The Ghettos,” possibly because of its relative proximity to downtown Las Vegas. It’s also about to face new competition from the proposed Great Mall of Las Vegas in Centennial Hills, a 1.6 million square foot, hybrid indoor-outdoor mall planned to be built in the northwestern suburbs of Las Vegas. Judging by my experiences in Las Vegas, they seem to have pretty high standards. While the Meadows Mall may have been the least successful of Las Vegas’ enclosed malls, it wouldn’t be considered as such almost anywhere else. It seems that maybe the pace of change in the valley is determined to swallow this one up before its time. Doesn’t look ghetto to me. Slow, maybe, but definitely not ghetto. With the Centennial Hills mall and a new mall in Summerlin scheduled to open at the end of 2007 or early 2008, I expect that to be the end of Meadows or as we locals call it The “Ghettos” mall. A large strip mall directly west of the Meadows Mall has been suffering for years. 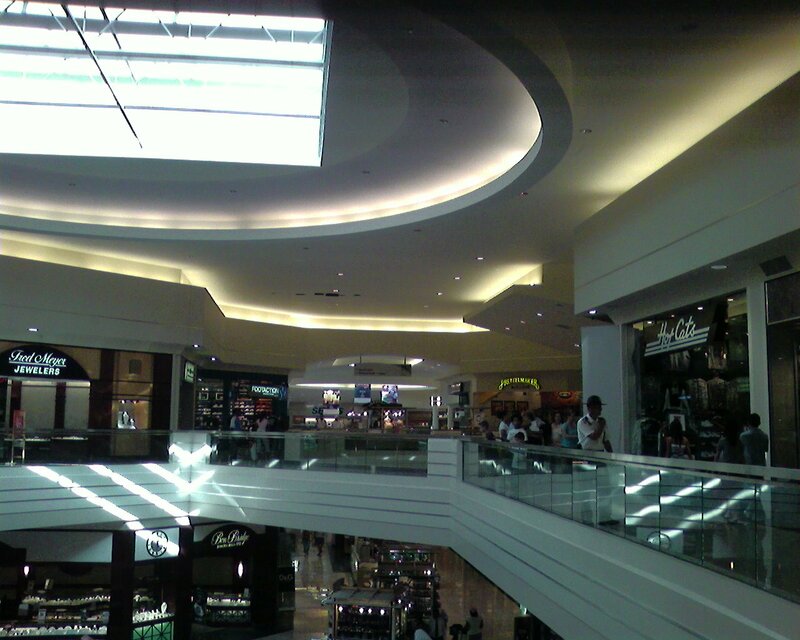 We would love to have a mall as nice as that in my town. I couldn’t find any contact info on the site (I probably just missed it), but I wanted to let you know that I love what you’re doing and that I gave you some props (and put up some info of interest) over at my own weblog. I’m really surprised Vegas is getting new malls… seems like we are loosing malls left and right in California (even with exploding population). Granted, the weather in Vegas is dreadfully hot and I would avoid the power centers at all costs! 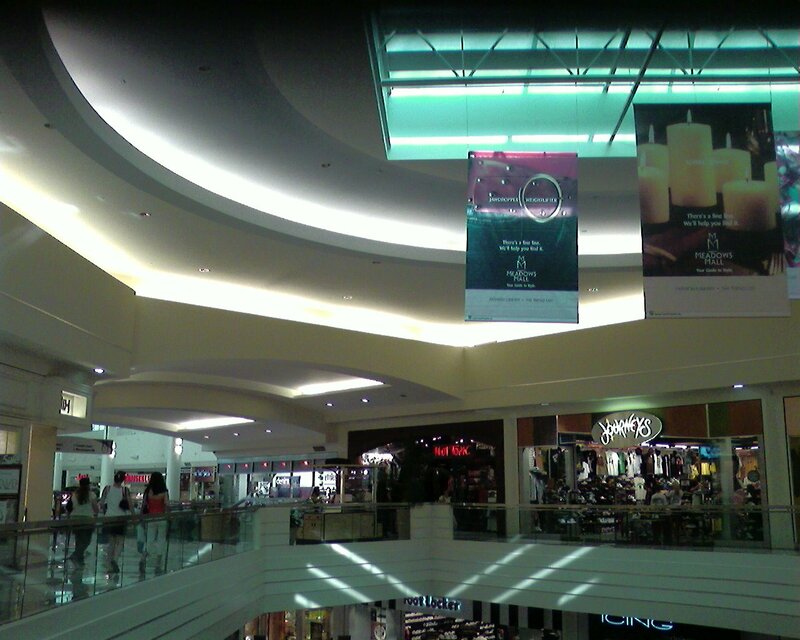 Nonetheless, Meadows Mall still looks good here. It seems like I remember there was a Mervyn’s in this mall the last time I was there. Is it gone now? There was never a Mervyn’s at the actual mall, but at a strip mall just west of it. 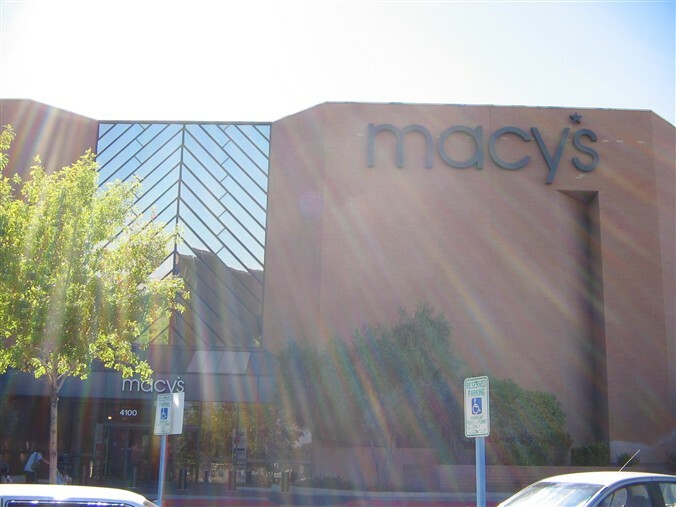 This mall was such a significant part of my childhood, at least until I was 8 and had to move to Arizona. My mom used to get her hair done at the Sears salon (when they had one) and we never left the mall without a corn dog and lemonade from Hot Dog On a Stick (it’s still there in it’s same place!). I moved back to Vegas a couple of years ago, and the interior of the Meadows still looks pretty good to me. The Meadows never fails to bring back those wonderful memories! Some stores are closing at the Meadows, only to reopen at the Boulevard, but the Meadows isn’t all that bad, the shopping nearby is great, too. Nothing is suffering nearby as the only store that has closed in the last 2 years is the Sav-On next to the center and that was because of the CVS acquisition of Sav-On. Westland Fair, Meadows, Loma Vista, Sahara Pavilions, and the Target/Big Lots shopping centers are all in healthy condition. There’s even a Trader Joe’s. Most stores of the valley have a location right around there. Only Summerlin residents call it the Ghettos because the neighborhood doesn’t look like Summerlin and they don’t like the drive. There are plans from GGP to turn The Meadows into an outdoor lifestyle center. If I’m not mistaken, I think Dayton-Hudson/Target built The Meadows and Loma Vista, which would explain the Mervyn’s and Target. @Eric, This comment was made before the recession. What would you say today? Meadows is a decent mall, but it lacks the two mall stores I shop at most Express Men and the Gap. I can find a Gap off of Rampart and Charleston, a ten minute drive from my apartment. Unfortunately Express Men requires a trip to Fashion Show or Boulevard. I laugh when people call the Meadows Mall the “Ghettos Mall.” Meadows is at least a fairly populated center. I recently moved to Las Vegas from Minneapolis. I think Las Vegans are not well aquainted with the dead malls that dot the midwest, so the do not know how “Ghetto” a mall can be. I would love to see this site do profiles on Brookdale Center and Northtown Mall, both located in the Minneapolis suburbs. @Greg, It became ghetto as the demographics of LV changed. This used to be a mall where a lot of suburban ‘white kids’ shopped and then the ‘hip hop’ kids started shopping there in the late 1980’s bringing the gang culture with them. Today, it is highly hispanic in nature. Long story short, this mall and two others are located off of LV Blvd. The malls on LV Blvd. are: LV Outlet stores, LV Prem. Outlet Stores, Crystals, Miracle Mile, Fashion Show Mall, The Shoppes at the Venetian, The Forum Shops at the least. Already seven out of ten are mainly for tourists. If Meadows is measured against the Fashion Show then it is definitely trashy, but is that a fair comparison? There was a stabbing at the Meadows Mall today. There’s stabbings everywhere in Vegas. There was a stabbing at Rainbow and Windmill, does that make that a ghetto? No, the Galleria has its share of problems as does the District. I saw homeless people at the District the other day, sleeping on the benches. Meadows isn’t bad, but the neighborhood isn’t great. (Not awful, but not great.) The only reason it survivives is that it is the only mall west of the 15 in Vegas. Meadows will die a very quick death if the malls in Centennial Hills and Summerlin ever actually open. The neighborhood is fine, a lot of ppl here in vegas have too much high standards, anyway, they are planning a whole urban-village redo of the Meadows and the Meadows is the only mall in Las Vegas with a Spencer’s, since its no longer at the Galleria. The Meadows also has great shopping around it. Hello I was born and raised in Las Vegas and had my very first job at the Meadows Mall way back when i just turned 16 I have never considered the meadows mall as ghetto it was a nice place to work except when it was time to take out the trash 🙂 I washed dishes in the restaurant that was next door to the Radio Shack the last time i was there it was a clock shop i don’t know what it is now. But i did enjoy working there. Meadows has lost a couple big name interior tennants, name Forever 21 (which has been replaced by some offbeat store called House of Shoes) and Express. I’d just point out that “Las Vegas” means “The Meadows” in Spanish, which is how the mall got its name. The site of Las Vegas spring lies just south of the mall and fed a bunch of (yes) meadows, which made it a stop on the Old Spanish Trail from Santa Fe to LA. The LV Metropolitan Water District has owned the springs for decades, however, and they’ve fed tanks to hold LV’s drinking water ever since. yess meadows mall is GHETTO, they should have better stores. 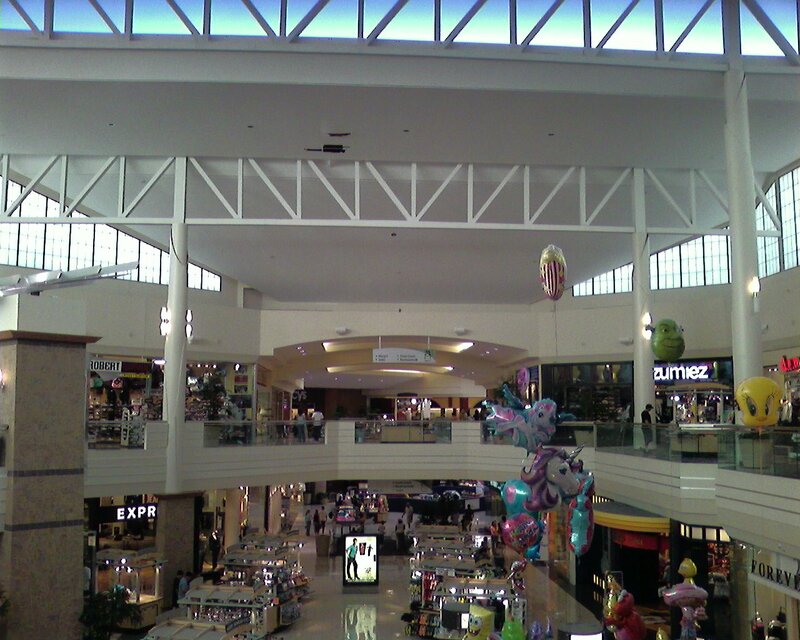 While the mall opened in 1978 and had its last major renovation in the early 2000’s, there was also a previous renovation in the mid 90’s as well. This was when they changed the logo and added the faux grass theme to the entry signage. During this upgrade they added a carousel to the main court called “The Menagerie”. They went for a light, airy pastel theme with a lot of plant inspired trim on the support columns. They replaced the 80s inspired fountain in the Macy’s court with a smaller, springs/meadows inspired one (that only lasted a few years). I remember when they unveiled this new design, people didnt get it, but they said they were doing it for the women or something to that effect. I find troubling with the most recent renovation was that they got rid of all character inside the mall…its nice, but plain. 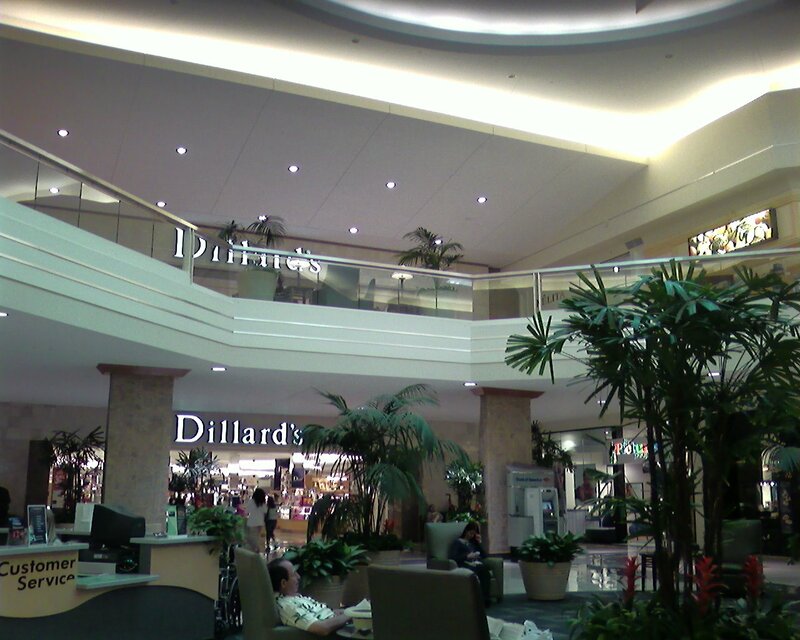 No more carousel, no fountain, no sit down restaurants in the mall – I miss the Ricardo’s as well as the restaurant inside Dillards…lots of memories in those places. I went to the Meadows Mall a few weeks ago. I had to spend forever in line to be checked out at American Eagle because I had to wait for the poor guy working there to explain 10 times over that the clearance signs say $9.95 and up. I would be so frustrated working at this mall because none of the customers speak English anymore. When the Summerlin Mall opens, which was pushed back to 2010, this place will go further down the crapper and turn into a huge flea market. It will fit the neighborhood. The Sears and Penney’s were originals, like you said in the main post the Macy’s was a Broadway originally and until the early 90’s the Dillard’s was a Diamond’s department store, which were also in Arizona. The Meadows also has great shopping around it. 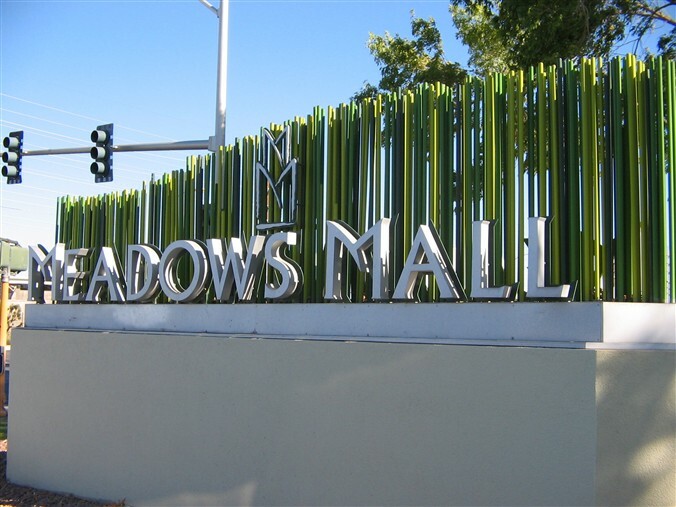 I grew up in Vegas, and at Meadows… it was always a very popular Christmas shopping destination when I was young! My years there were mostly 1981-1988 or so. Remember Hot Dog on a Stick (of course), only place in Vegas you could get one! I went to the Jr High located right behind the mall, and it was around that time, early 90’s, that the mall began its renovations. 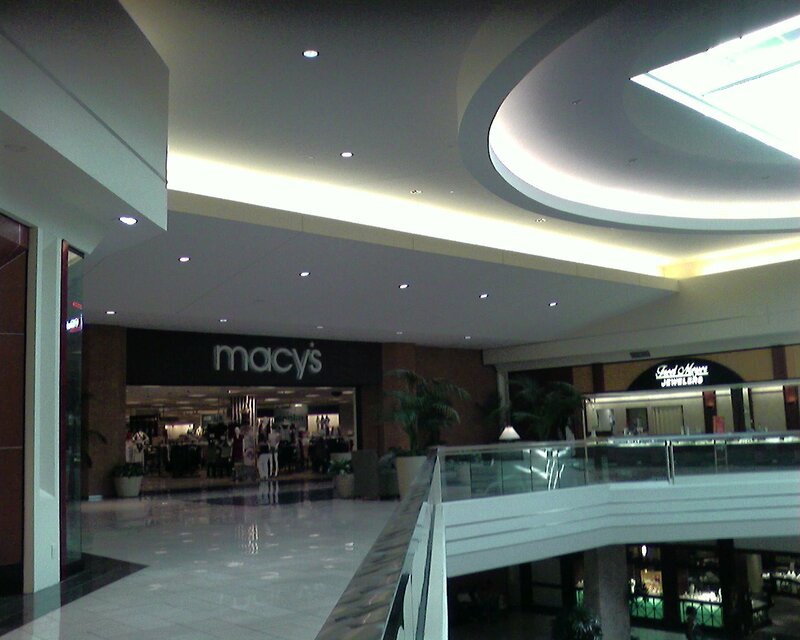 They seemed to last throughout the entire 90’s- I never have seen the newly revised mall. The pics were kind of depressing- it just looks totally generic now. But the Ghetto nickname really does stem from back in the day before Vegas became kid/family friendlier and this mall was the closest to the undesirable nieghborhoods close to the strip, when this WAS the least desirable of the malls. The reputation was greatly helped by several crime-laden apartment complexes nearby (one in which I lived), and the steady urban decay of the several small strip malls across from the mall (Al Phillips, anyone? Makin it easy for YOU!). It obviously doesn’t *look* ghetto inside. It never really did! Vegas has always been very, very careful to convert and maintain higher profile areas that could be tourist locations- the city would never allow a mall to look seedy. They save that for MLK and NLV Blvd! I grew up in the Boulder/Flamingo area, and it used to take me 12 minutes (I timed it) to get across town to the Meadows in the early 80’s. I remember visiting the Diamonds (Dillards) store with my family just prior to the rest of the mall opening. I guess it was 1978 but it seems more like ’79 in my memory. Vegas was so puny back then. My favorite store was The Game Keeper because they were one of the few places in town that stocked Dungeons and Dragons stuff. Boy, was I a winner back then! And I remember buying a Miami Vice/Sonny Crockett style white jacket at a place called the Oak Tree in 1985. Later, I shopped for business suits at Dillards and The Broadway. One of my main memories from this time period was fighting to get a seat at the food court. They just didn’t have enough tables. The only Mall my family visits at all these days is the Galleria in Henderson. It is somewhat of a mystery to me that indoor malls aren’t doing better here. There are times in the summer when it is just so damn hot that taking a walk in the Mall is just about the only exercise you can get. I don’t quite understand the predominance of the outdoor type malls so far as recent construction goes. I guess it is just too expensive to cool an indoor mall. Perhaps with the collapse of the real estate market here, there will be more interest in upgrading and maintaining existing structures as opposed to just building new stuff. Vegas just grew too fast for too long. I wouldn’t start pounding nails into this place’s coffin just yet…. @Andy, your comment about the cost of cooling an indoor mall is correct. It is too cost prohibitive anymore. 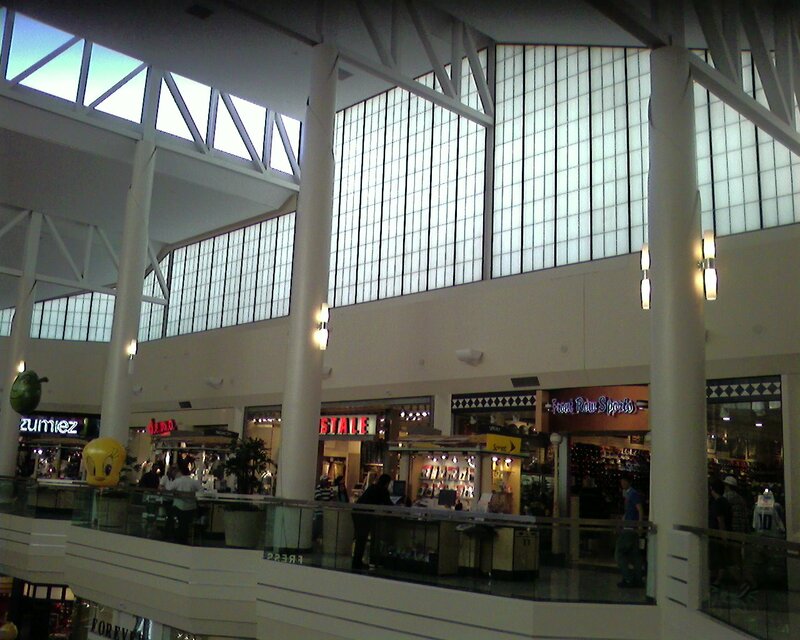 Also, if you notice, people with less money these days walk in to the mall, look in the front glass, and then spend all of their money in the food court. Large retailers hired ‘observers’ long ago and realized their best bet was to have a stand alone store. Then people only shop at their store. That is why the latest JCP store near 215/Flamingo in that way. 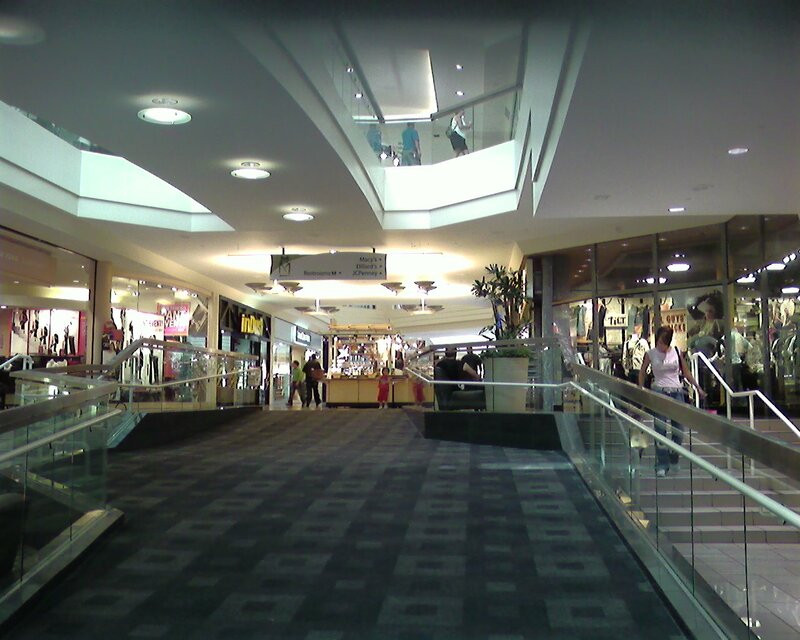 Why pay to air condition shoppers that spend nothing at your store. My family and I moved here when I was only 9 years old in 1982. I have used and visited this mall all of my life. I am now 37 in 2010. This mall used to be filled with really good stores like ‘Levi’s Outlet’ of prior ages. During the late 1980’s the rapper/gang banger culture began growing a lot in LV and they liked walking around this mall giving dirty looks to people. Long story short, this mall is a victim of its inabilty to legally keep them out. People with money will not spend it in such an atmosphere. Would you buy a diamond ring only to be mugged in the parking lot? 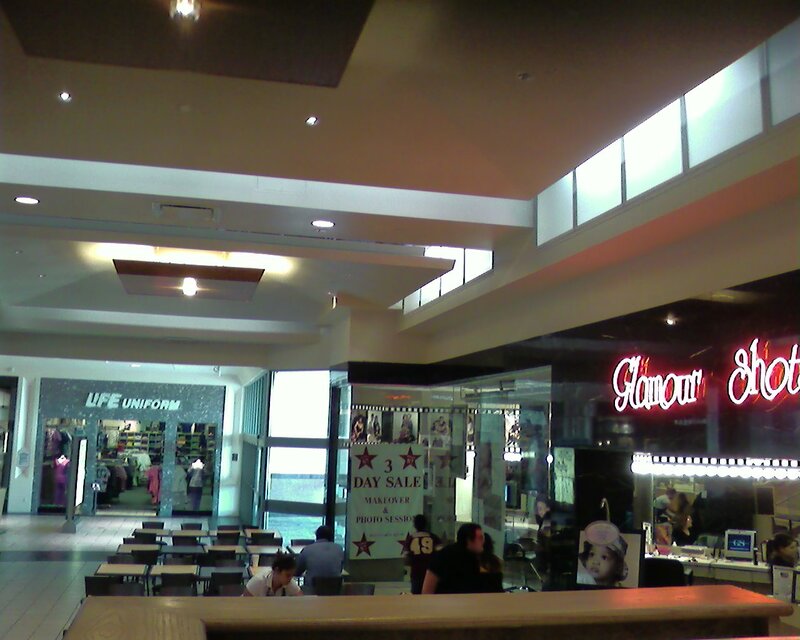 The food court is always busy, but some of the anchor stores have let the maintenance go too much on their floors, ceilings, and throughout. Example: Missing and broken floor tiles in the JCP store. Most of the big retailers have larger, newer stores (like JCP) throughout town that are easier to park at and work well for locals like myself. Also hurting this mall is the rapid turnover of the smaller shops and vacancies throughout. It is, however, a site for early voting, new school registration, etc. and has become somewhat part of the public services infrastructure. Of course internet shopping and the local economic collapse have hurt it as well. It is now run by GGP and they are more committed to its well being than prior owners.